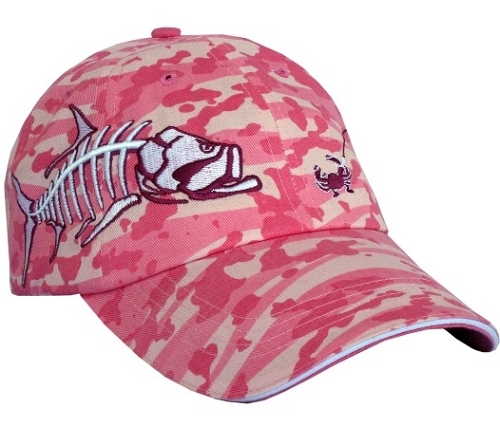 Jumbo SKELETAL TARPON Ladies FISHING CAP. 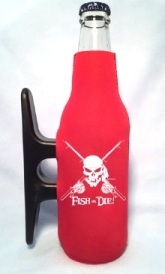 Our sensational new "Roseate" Pink CAMO with rose trim - Embroidered 3-D SKELETAL JUMBO TARPON Bonefish-style graphic on front/side chasing bait - Comfortable, relaxed fit, 100% washed cotton twill, Get Reel…Get Fish! embroidery on rear velcro closure. 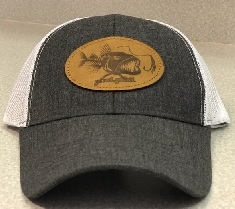 New Color, GREAT NEW LOOK on a unique, high stylin' TARPON Ladies Camo Fishing Hat!